and does not stop until you get into the office." A prominent German psychiatrist by the name of Manfred Spitzer recently wrote a book called Digital Dementia. In it, he claims that teaching children to use online media is akin to giving them beer and that putting computers in elementary school is no different from heroin dealers getting their users hooked. Spitzer believes that digital media makes us "fat, dumb, aggressive, lonely, sick, and unhappy." Perhaps this view is a bit sensational, but he has a point. How often do we reflexively grab our smart phones to ask Google for an answer, rather than asking our brains to do a little work? How many phone numbers do you memorize these days? Is the Digital Age making us dumb? It depends on whom you ask. Scientist Susan Greenfield is so concerned about the effects of digitization on the brain, and thus us as people, that she likens this "mind change" to an issue as serious as climate change. Her argument states that most time spent using digital mediums is not only replacing information gathering with learning, but it is also meaningless and without consequence. She fears this will cause us to lose perspective on our real life actions and their consequences, which she believes could have dire impacts on society. Others point out that every significant technological leap has brought with it Luddites sounding the alarms. Socrates worried that the ability to write would impair the ability to remember. The less alarmist camp argues that the Internet isn't making us dumber, it's just making us different. 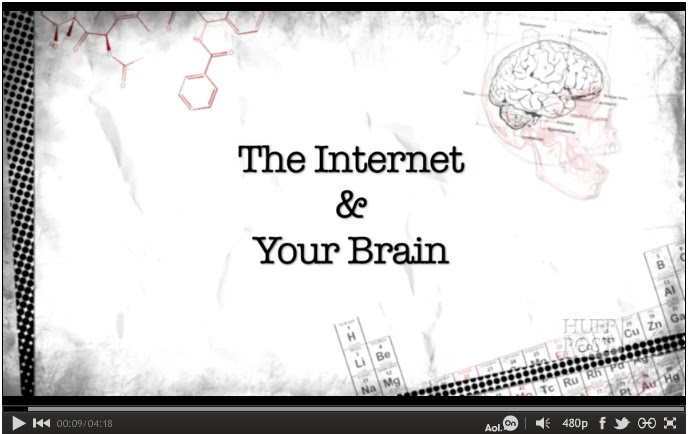 The Internet does affect our brains. In fact, people can be clinically addicted to the Internet, and the brain activity of those who are mirrors that of drug addicts. 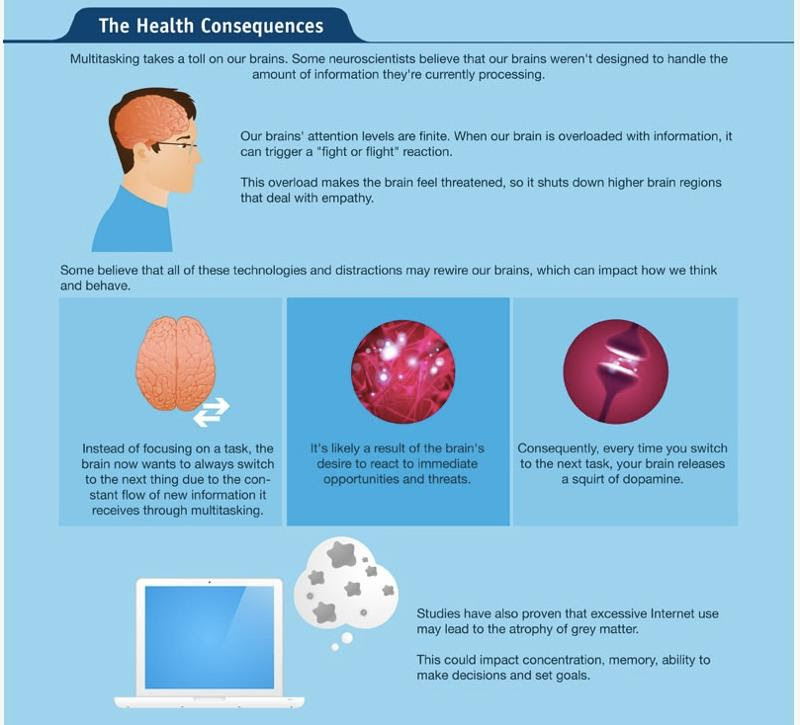 However, for most of us, the risk of digital mediums is information overload, which causes a fight or flight reaction in our brains and a stress reaction in our bodies. 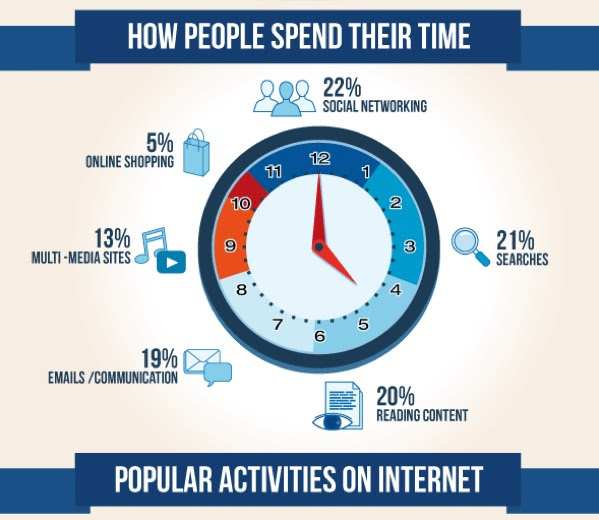 Digital devices have made us digital multitaskers. How many tabs are open in your browser right now? How many times have you checked your email since you started reading this? On average, we change tasks more than once every two minutes. This is the result - click for the full infographic. Despite this digital overload, IQs have been on the rise for decades, a phenomenon known as the Flynn Effect. James Flynn has studied this trend since the 1970s. 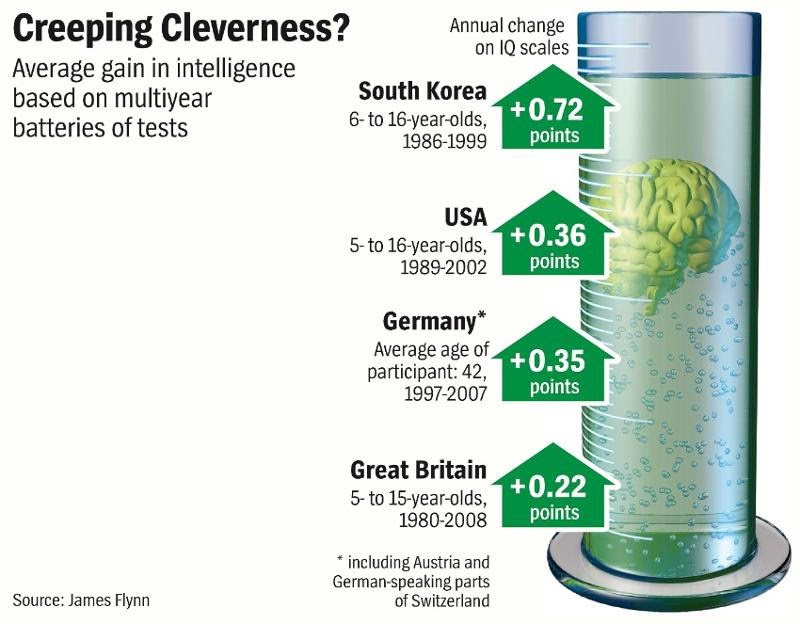 Flynn credits an improvement in dealing with abstract concepts as the cause behind rising IQs. Flynn says this is purely circumstantial; our ancestors were no less smart, he argues, they just thought in a more practical way because that is what life demanded of them. Interestingly, while many kids today might have higher IQs than their parents, their vocabulary is not expanding at the rate of their parents. Flynn does cite short Facebook and text messages as a possible culprit, yet he is un-alarmed, believing that this is simply how younger generations are adapting to a fast-paced, digital world. More alarming to Flynn is how everyone's IQ slips as they age. Paradoxically, the smarter a person is to begin with, the faster their IQ falls. The only fix here is: Exercising the brain. Sometimes even with the help of the Internet. The brain remains a relatively uncharted frontier in science. We know quite little about it. If the Internet's affect on the brain tells us anything unequivocally, it's that the brain can change, that it's a function of its environment, "plastic," in neuroscience parlance. There is also plenty of evidence to suggest that we can change our own brains, even make them sharper, and keep them adept well into our later years. In this month's TLV, we'll look at what we know about the brain today, and what research shows we can do to change and improve our very own brains. In December, many look back to see how the year behaved. Did it meet, fall below, or exceed our expectations? At Leyendecker, we always try to set high expectations, but keep them measured against reality. One well placed foot in front of the other, one value creation effort after another, one new relationship and then another. That's how our business grows. Always do the right things and the money will follow. Being in Houston, we are certainly happy to accept the gifts of a right place right time economy. If Houston's economic appeal isn't self-evident enough, just count the number of out-of-state license plates on the road. Let's just hope that all these new Texans are here to realize the prosperity our work ethic can bring instead of moaning and groaning for handouts. Success begets success, so Houston is well poised to grab and grow economic activity. Those of us who've weathered enough bubble bursts might feel a reflexive concern about the number of construction projects popping up all over town. But could it be that Houston is about to spread its wings and find greater economic and political responsibility and power? There is no city better positioned than Houston to lead the country out of its economic malaise. All economy begins with natural resources, and the more natural resources one possesses, the more economic activity one can create. As global leader to the natural resource industry, Houston could and should fill that important economic leadership role for this country. As one Boston investor recently suggested, Oil & Gas is the new Internet. That certainly could be so, but only if we get more people in Washington and on the coasts to understand the value of natural resources to an economy. Otherwise we will continue to sail against, rather than with, the wind. Can you imagine any emerging economy not using all its competitive advantages? The Federal Reserve just announced their new policy. Monetary stimulus - read, money printing - will continue until unemployment is below 6.5% and inflation above 2.5%. Pundits have attempted to decode the broader Fed message and determine the significance of these benchmarks. Those benchmarks are less exact than they sound, with the Fed capable of considerable wiggle room given certain events and metrics as they occur. But we can't help but be struck by the larger implication here...Does the Fed now define a healthy economy at 6.5% employment? Wasn't that about 5% a decade ago? The best number crunchers we follow suggest unemployment won't possibly reach 6.5% until 2018. That's five years from now and three years after 2015, the year the Fed (most recently) claimed they might stop "stimulating" the economy. No matter how long the Fed claims it "needs" to pump our economy, declaring any need at all doesn't speak very well of our economic and employment growth engine. More interesting is the lack of concern people seem to have that we are extending our government managed economy for maybe five more years. I guess the new normal is just more and more stimulus. "Yawn...Nothing changes so why get upside down about anything? Government's got my back!" So where are these jobs that will get us to 6.5% unemployment going to come from? Outside of the energy and energy infrastructure industries, there doesn't seem to be great growth opportunities. The restaurant sector has recently seen job growth, but is now showing declining revenue numbers. And we certainly can't pin our hopes for a healthy economy on job growth in the lower paying retail store clerks, nurses' aides, and social workers, other sectors that have also recently seen growth. With interest rates at historic lows, maybe real estate could lead economic activity. But then, isn't real estate supposed to follow the primary economic driver? Logic doesn't require tremendous thought, just a clear and informed mind. This month's focus on the brain in our Too Much Information world is pertinent to leadership and management. Several times in The Leyendecker View, we have suggested a need to step back from the maddening effect of TMI. Maybe we should even consider it a new form of water torture, or at least something that merits questioning. We have more information at our literal fingertips than ever. Is all this information really getting us to better decisions? Or is it just clutter that buries the relevant information, impairing our ability to make the most productive leadership and management choices? Maybe it's time to turn off the TV, Internet, phone, radio, and video game console and take up things like backgammon, cards, woodworking, cooking, and gardening. Imagine the mind space that would be freed up by cutting the noise out and letting the quiet in. Real average hourly earnings for all employees rose 5% from October to November, seasonally adjusted. This change resulted from a 2% increase in average hourly earnings combined with a 3% decline in the Consumer Price Index for All Urban Consumers (CPI-U). The CPI-U declined 3% in November on a seasonally adjusted basis. Over the last 12 months, the all items index increased 1.8% before seasonal adjustment. In this issue about information everywhere all the time, it seems only fitting that the chart we sought out to create had already been created, and with far spiffier graphics than we could have pulled off. Sometimes there's just no need to reinvent the wheel. 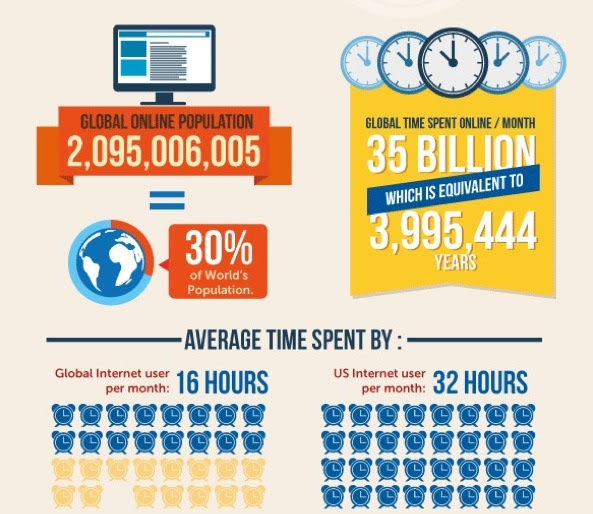 Click the images for, yes, more information and fascinating statistics about global online usage and what people do on the Internet. "I have a theory about the human mind. A brain is a lot like a computer. It will only take so many facts, and then it will go on overload and blow up." A crucial factor in brain development is broad exposure to different kinds of stimuli. Digital technologies, however, reduce that breadth and take up more of our time. Worse yet, the type of information that we get online is so rapid fire that we rarely progress to the point of critical, conceptual thought where we connect data. Instead, our brains get overflowed with disconnected bits, impairing our ability to discern the important from not, while simultaneously causing us to crave new information. So we frantically cursor from screen to screen in search of new data. 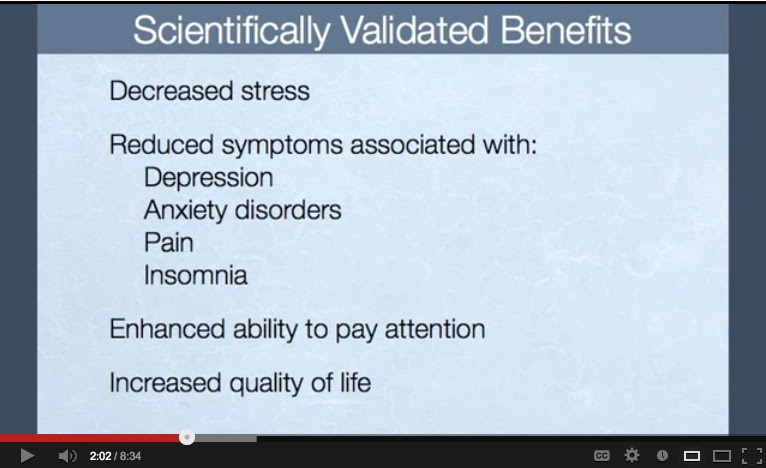 When we get it, our brain releases dopamine...and we officially become useless info junkies. The brains of rats that are given the ability to exercise have been shown to grow. 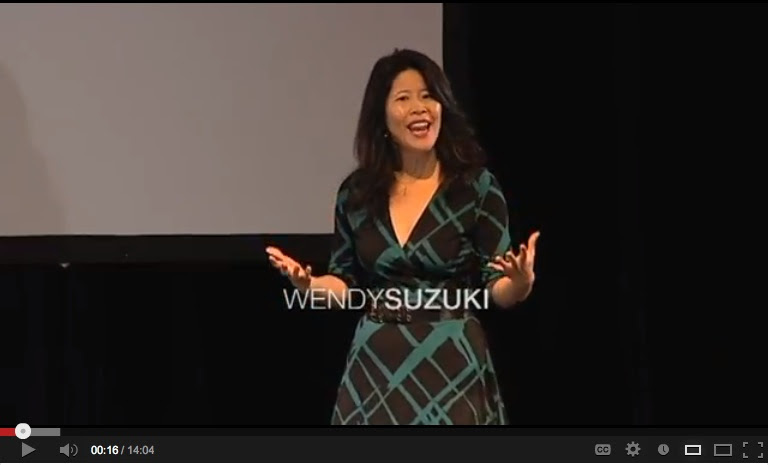 Expanding from this research, neuroscientist Wendy Suzuki's studies show that physical exercise has a direct correlation to improved cognition, long-term memory and possibly even creativity. Watch to get motivated off the couch. As part of a brain study, people with zero juggling experience were asked to practice for three months. Brain scans taken before and after showed that the gray matter in these participants' brains associated with detecting visual motion had changed. This phenomenon is called neuroplasticity - the concept that repeated behavior can cause physical changes in our brains. Watch the video to learn how repeated meditation has been reported to improve brain function in the areas of learning, emotion regulation, perspective-taking, empathy, and compassion. Forgetting is the brain's natural way of moving on from past pain, as well as moving out useless information to make room for more important information. The Internet - by way of eternal Facebook posts or emails - has made it harder to forget. You might stumble across an offensive message a year later, making you angry all over again. Forgiveness and mental health both suffer. This article argues for regular digital purges in order to avoid reliving negative emotions and promote healing. Brain scans of couples reveal moments where brain activity was completely identical. This means that couples could more easily know each other's thoughts and emotions, even predicting what the other will say. This slideshow shows brain imagery over time, from hand drawn renderings of the brain of the 1800s to stunning MRI photography of today. With such an unthinkable amount of activity and detail in our brains, it's no wonder we still know so little about them. 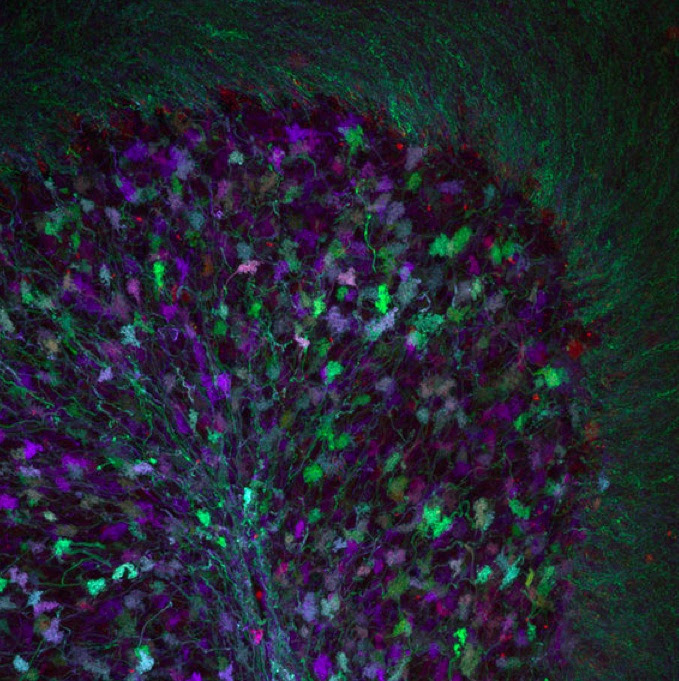 An example, the cerebellum: "The colored splotches reveal so-called presynaptic terminals, or junctions through which neuron signals are sent, formed by the cerebellum's axons." 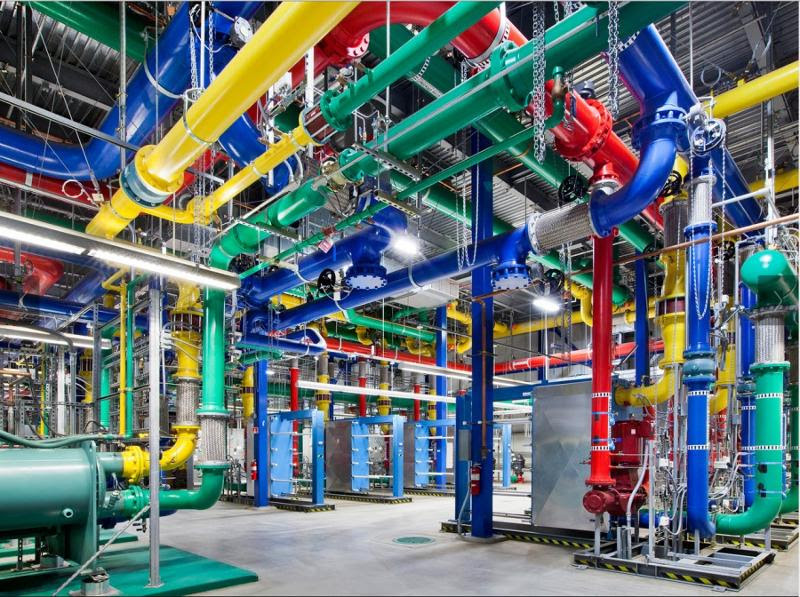 For comparison, pictures of "Google's brain" - almost as complex as our own brains. Which brain will remain in control? How much of our GDP could the fiscal cliff knock out? 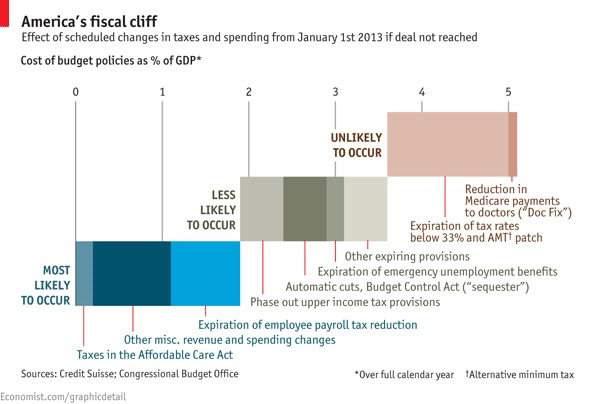 Economists at Credit Suisse built this chart to show the components of the fiscal cliff and their likelihood of occurring. If all were to occur, the total hit to our GDP would be about 5%. A likely scenario is that payroll taxes will expire, Obamacare taxes will go into effect, and other revenue/spending changes will take place, knocking out nearly 2% of GDP. Yikes. 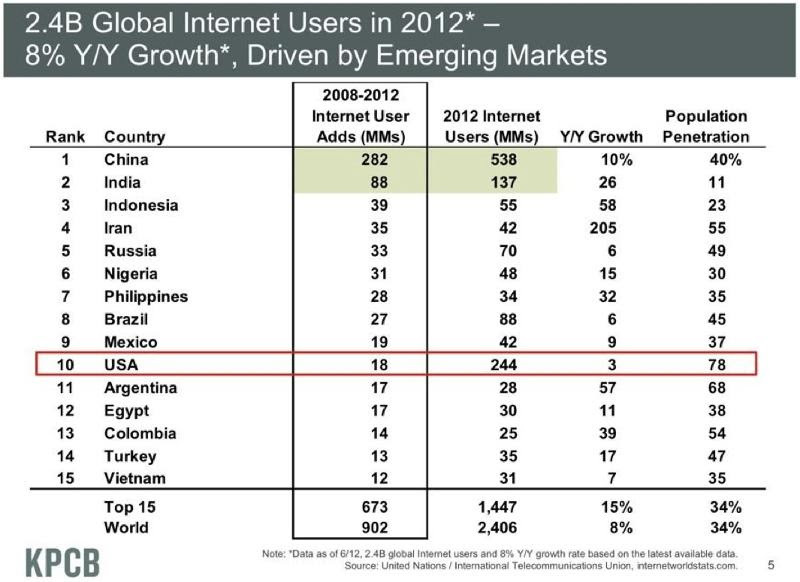 Kleiner Perkins partner Mary Meeker recently presented these fascinating slides at a year-end review of the Internet and digitization. 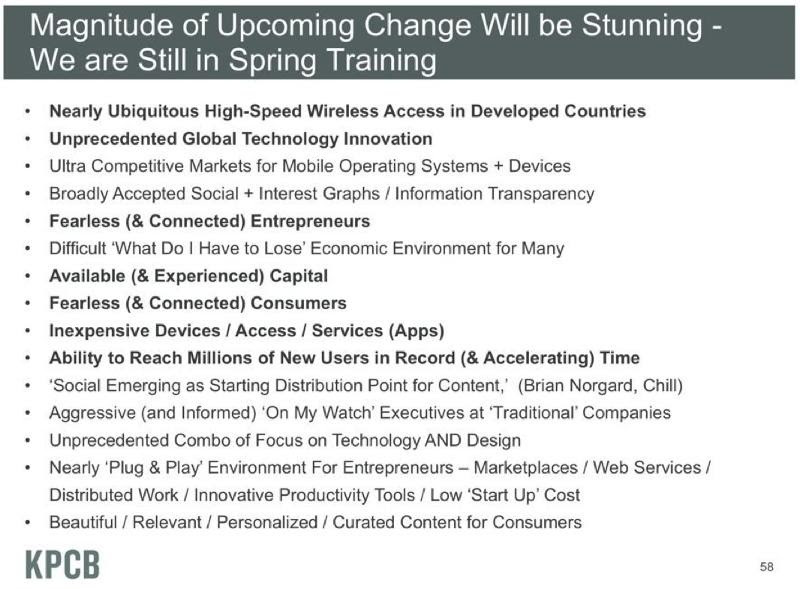 In short - we have not even begun to see the economy disrupting, paradigm busting, life changing effects of mobile and digital media. Follow the link and scroll down to see how digital has seeped into every aspect of our lives, and imagine where it still has to go. Gareth Jones, London Business School fellow, says that for the 120 years we've been studying modern leadership, we've been asking which types of people become leaders. 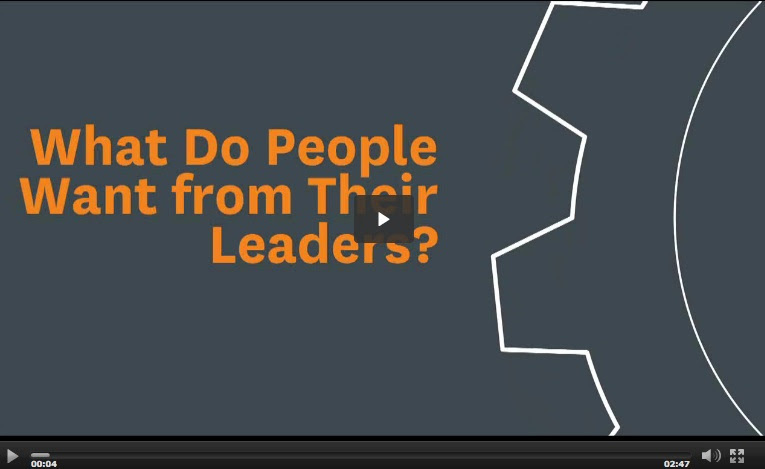 Jones argues that in a tumultuous economy, where trust - in bankers, politicians, lawyers, business leaders - has been jeopardized, we need to ask a new question: What do followers of leaders want? They want community, authenticity, significance and excitement. Watch for more detail. Every time we say yes to something in our lives, we are necessarily saying no to something else. The successful will focus not on what was given up, but on what must be done to reach the chosen goal. For managers and leaders, this means deferring responsibility and authority to those best suited for it, or what former HP CEO Lew Platt referred to as "managing the white spaces on the organizational chart." The brain is divided into three main parts: the neocortex, the analytical data processor; the limbic system, the emotional area; and the brain stem, which manages survival. The primitive brain stem, called the "lizard brain" by Seth Godin, is where your safety or threat level is determined. Read this article for tactics to create a sense of urgency around your marketing and sales messages and impel customers to break from their status quo by buying what you're selling. Responses to a survey taken by employees at over 1,200 companies show that above everything else, people hire for cultural fit. Next in line, professionalism, high energy, confidence (something that survey takers believe is commonly lacking from employees), the ability to self-monitor and intellectual curiosity.